The GW INSTEK GDS-1000-U Series offers 100MHz, 70MHz and 50MHz digital storage oscilloscopes with 5.7" color TFT LCD displays. With dual sampling modes, a 4,000 point record length, a real-time sampling rate of 250MSa/s and an ET sampling rate of 25GSa/s, the GDS-1000-U Series DSO provides an excellent balance of performance between memory length and sampling speed. Other major features include user-friendly menu tree operations, compact size, ergonomic design, USB host for PC connectivity and USB device port support. The GDS-1000-U Series is designed to meet today's most demanding engineering requirements and budgets. Today's integrated designs need an oscilloscope that is just as integrated -such as the MDO3000 Mixed Domain Oscilloscope (MDO) Series. It is theultimate 6-in-1 integrated oscilloscope that includes an integrated spectrumanalyzer, arbitrary function generator, logic analyzer, protocol analyzer, and digital voltmeter/counter. The MDO3000 is completely customizable andfully upgradeable. Add the instruments and performance you need now - orlater. When working under tight deadlines, you need your oscilloscope to beintuitive; you want to minimize time spent learning and relearning how to useit. The TDS3000C Series oscilloscopes help reduce your learning curve.Simple navigation and dedicated front-panel controls get you to where you want to be quickly, so that you spend less time learning and more time onthe task at hand. The TDS3000C Series comes equipped with a USB host port so you caneasily store and transfer measurement information to your PC.OpenChoice® PC Communication Software allows you to simply pull screen images and waveform data into a standalone desktop application or directly into Microsoft Word and Excel.To complement Open Choice, National Instruments LabVIEW Signal Express™ Tektronix Edition Software provides you with extended capabilities including advanced analysis, data logging, remote instrument control, and live waveform analysis.If you prefer not to use a PC for analysis, the TDS3000C Series comes standard with 25 automatic measurements, waveform add, subtract, divide,and multiply math functions, and Fast Fourier Transform (FFT). Unlike other comparable oscilloscopes, the TDS3000C Series math and measurement allows you to use the full acquisition record length or isolate a specific occurrence within an acquisition. Utilizing the built-in Ethernet port, e*Scope web-based remote control allows you to a control TDS3000C Series oscilloscope from anywhere, using the Internet and your PC. The TDS3000C Series packs the power of a DPO in a compact design thatis only 5.9 in. (149 mm) deep, freeing up valuable benchtop space. And when you need to move your oscilloscope to another lab, its portable 7 lb. (3.2 kg) design makes for easy transport.If your work demands even more mobility, then the optional battery pack willgive you up to three hours of operation without line power. The 30MHz GOS-630FC establishes a new bench mark for economical analog oscilloscopes. Innovative functions, including an LCD readout display, frequency counter, and an Auto Time-Base setting are standard features. A 1mV/div vertical sensitivity is able to capture small signal variations from input sources. Additional functions such as XY mode display, MAG function (magnified time base), andZ-axis Input make the GOS-630FC suitable for both education and industry use. 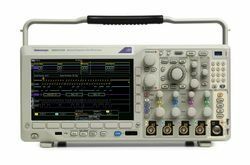 The added value of theGOS-630FC makes it one of the most beneficial choices among entry-level analog oscilloscopes available in today's market. 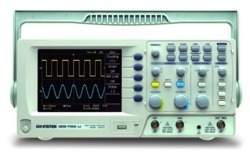 Scientech 803 Mega Scope is a new generation, user friendly Oscilloscope. Besides giving a smooth digital touch, it is equipped withUSB interface (optional). The Volts/div. & Time/div. readings are displayed on LCD. A built - in Component Tester, rugged design and bright display makes it very useful for laboratory use. The Vertical bandwidth is more than adequate for all your needs and you can easily view signals upto 40 MHz. The 4 Trace operation allows you to viewnormal (X1) and expanded (X10) signals simultaneously. 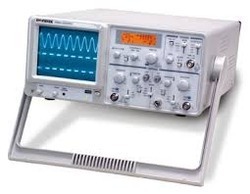 Calibrator : Square Wave generator 1 KHz approximately, 0.2 V ±1 % for probe compensation. USB Interface (Optional) : For remote control settings ofVolt/div. & Time/div. Product Tutorials : Online (Operating procedure, Frontpanel control, Theory, Control software optional). Included Accessories : BNC to Crocodile cable -1no. BNC to Test Prod cable -1no. Power cord -1no.Test prods -1no. 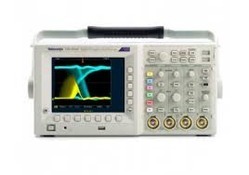 Looking for Digital Storage Oscilloscope ?